The global sports betting market continues to surge in popularity. In fact, it’s one of the fastest-growing sectors in the world, offering tremendous potential for both sportsbooks and bettors. With the digital revolution in full swing, the sports betting industry continues to undergo dynamic changes, expanding in established markets and forging its way into new ones. In this article, we’ll lay out the overall size of the global sports betting market, explore some projections for its future growth, and try to pin down the root causes of this rapid market expansion. How Massive Is the Sports Betting Market? It’s important to recognize that the overall size of the sports betting market is difficult to estimate because regulations and record keeping are inconsistent. There is no definitive resource, from nation to nation, that researchers can solidly rely on. Records are too disparate to paint an entirely accurate picture. That said, it doesn’t mean that there aren’t reliable estimates. International sports betting is estimated to have a market capitalization of $250 billion. According to Statistica, a highly-reputable firm, licensed online sportsbooks (like the ones we review) account for upwards of $39.7 billion of this revenue. The rest of these sports bets are staked at venues like casinos, at horse tracks, or other global conduits. In 2009, the sports betting market was valued at $20 billion. By 2016, it was valued at $40 billion. With a present market capitalization of (conservatively) between $60-73 billion, the market has conservatively grown at a rate of $10 billion per year. If this pace continues, American sports betting will occupy an increasingly significant share of the world market. According to a recent Statista survey, over 50% of US citizens admitted to placing a bet on a sporting event at least once in their life. Given the stigma that still hovers around sports betting in the US, it’s possible that some of those polled in the survey weren’t entirely forthcoming on whether they’d bet on sports. With a population of more than 4 billion people, it’s of little surprise that the APAC region occupies the most significant percentage of market share in the sports betting industry. It’s estimated that residents falling in the APAC region are responsible for 47% of the world’s sports wagers. The answer is simple: increased wealth and expansion in digital connectivity. Historically, Macau and Hong Kong (both within APAC) are two of the most prominent sports betting revenue-generating regions in the world. Economic prosperity throughout the rest of the region, however, provides disposable income for leisure activities, such as sports betting. As real wages continue to increase in the APAC region (as they are projected to) more and more money stands to end up being placed on sporting events. Furthermore, internet providers in the APAC region report significantly increased penetration in the market. Better internet connection allows people to consume the latest news and information in sporting. It’s a lot easier to become a sports fan (and sports bettor) when you’re able to keep up with the latest in sports on a weekly, daily, and even hourly basis. According to Transparency Market Research, APAC forecasts to expand at a CAGR (Compounded Annual Growth Rate) of 12.9% from 2018-2024. Asia’s projected growth rate for their sports betting market outpaces any other region in the world. How Much Will Sports Betting Markets Grow Elsewhere? Sports betting currently accounts for upwards of 40% of global gambling revenue around the world, which is more than any other section (inclusive of lotteries, casinos, poker, and other forms of gaming.). According to the latest projections from market research firm Technavio, the CAGR (Compounded Annual Growth Rate) is expected to increase by a whopping 8.62% from 2018-2022. While all eyes are on the US and APAC regions, sports betting is still growing in other areas of the world. Though growth may not seem as aggressive or impressive in Australia and Europe, it’s mainly due to a long history of sports betting in these regions. However, sports betting is still growing steadily in these regions. Africa and Latin America make up a large contingent of the global market, but not as much as APAC or the US. This is primarily linked to broader macroeconomic factors which affect GNP, and limited internet access. What Are the Most Popular Sports Bets Around the World? Football (the European kind) has, by far, the greatest betting volume, closely followed by American football. The other big three North American leagues (MLB, NBA, NHL) receive a significant amount of betting volume, too. Horse racing, while often categorized as a niche market, still receives heavy betting volume in the US, UK, France, Australia, and South Africa, which are all sizeable markets. 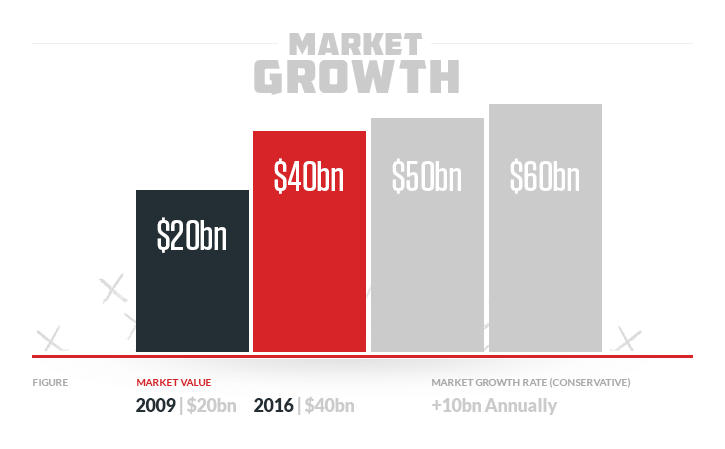 The fastest growing sports market (in regards to betting volume) is esports. For those unfamiliar, esports are organized, multiplayer video game competitions which involve profession players. The games may range from Starcraft to Player Unknown Battlegrounds. In 2017, esports generated over $650 million in revenue, and are projected to create upwards of $1.5 billion by 2020. According to a senior analyst at the market research firm Technavio, the increased popularity of esports is pushing bookmakers to allow bets on many different esports matches, now including golf, tennis, and rugby. This growing volume is driving revenue generation across the sports betting industry. As esports transform from a budding industry to a more fully-formed, established one, it will generate a significant revenue stream for the broader sports betting market. Where Does the Future of Sports Betting Lie? All market research points to one thing behind the continued popularity of sports betting: the digital revolution. The massive projected growth figures for sports betting are in large part due to the proliferation of internet around the world, and sportsbooks’ subsequent investment in their digital platforms, as a response to the demand for online sports betting. It’s never been easier for people around the globe to connect to the internet, and subsequently, start betting via sportsbooks. The penetration of digital sports betting goes beyond laptops and desktops. Globally, 20% of sports betting now takes place via mobile. By the end of 2019, this figure is projected by to upwards of 45%! Sportsbooks, especially the sites we review, have responded to their consumers’ demand for increased connectivity. Bettors are seizing new opportunities made available by these advances. Technology has changed how we work, how we play, and the way we live. It’s also transformed how we bet on sports. We’re not entirely sure what the next major advance in the digital revolution is going to be, but we’re sure that it’s going to make betting on sports bigger and better. Aaron has been SBD's Lead Betting Analyst and lead researcher since 2017. He has been featured in publications such as Intelligence Magazine, The Investing News Network, Haven, Tech Bullion, and many local and national publications. Western B.A. '14, NYU M.A. '17.